Every month, Ad Lib contains advertisements for brands that have been through the client review process, followed by the research group grinder. I'm painfully aware that the final result is often a pale imitation of the initial thought. So it seems harsh to then sit in judgement of it. However, there is one genre of brand communication where there are no committees and no restrictions on creativity. I am talking about the house ad. With the house ad, there is nobody else to blame for the result. Our agency has just gone through the process; not only did we change our name, we redefined our very essence so that everyone knows exactly what we stand for. Naturally, the results are brilliant – a triumph of insightful re-branding, which will undoubtedly double our billings next year. But how do our competitors – the staggering 97 healthcare agencies out there – differentiate from one another? How do they express themselves in this challenging economic climate? To avoid accusations of cherry-picking, I have chosen five agency ads from the November issue of Pharmaceutical Marketing as a fair sample of the market. Let's see how their stock is fairing during the credit crunch. I really, really like this ad. The acres of white stop you far quicker than any contrived visual, and it gives me space. Space to think. Space to breathe. Space to move around. At last a piece of communication that says little but speaks volumes about the agency, their work and their beliefs. The creative at Langland is under new care, and if this is a taste of things to come ... well... it's got my sphincter going. This execution is the polar opposite of their last house ad, and I have to say that's a good thing. If I were a client, I would be on the phone today. There's one thing in life that will never be attractive, and that's armpit hair. No amount of blood, sweat and tears will make it so. This is the agency that will weep and seep for you in their endeavours to deliver the very best for your brand. And what's more, they will do it in an 80s Athena poster style. But should effective brand building prove to be so tortuous? If I were a client I would take little comfort in knowing my agency was losing so much bodily fluid in the struggle to find a creative solution. Sure, it's never easy, but there are plenty of agencies out there that put in a huge amount of effort. So where's the added value? Verdict: This certainly is a Bull market. Ah. 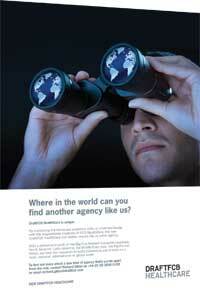 The global agency ad. Well I hope so because if this was created in the UK, the art director has got thicker glasses than the bloke in the visual. Now some global advertising works. Apparently. But this is a good example of a piece of communication trying to appeal to all markets, and in so doing, appealing to none. Have you ever been sat in a dentist's waiting room, thumbing through a National Geographic from 1972, looking at the Papua New Guinea ladies with no tops on? Well slot this ad in and I promise you it would not look incongruous. 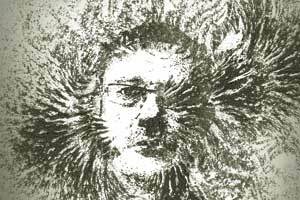 Being part of a global network does not mean you have to lose your individual identity. Verdict: Your hedge fund is about to go through the mulcher. Sell, sell. Another strong offering from an agency that consistently impresses the awards judges. And rightly so. Take this example. It would have been all too easy to have some brand manager looking wistfully out of their office window. But no. We have a beautiful location, full of visual interest and in sharp focus. This draws your eye to an equally crafted headline. It's another case of bold, thought-provoking understatement. This is an agency of decision-makers who knows what to do when presented with a knotty problem. What's more, when they've had their light-bulb moment, they'll simply roll up their sleeves and "go to work". No messing and, unlike the Life agency, no mess. Verdict: A gilt-edged investment. Buy. This series has run and run. As with most campaigns, some renderings are stronger than others, and I'm not sure about this one. I like the idea, and they've integrated the signature red ribbon in a neat way. But if you're going to use an oft-photographed subject, then photograph it better than anyone else. I'm missing some of the drama that surely accompanies such an iconic object. Shame. 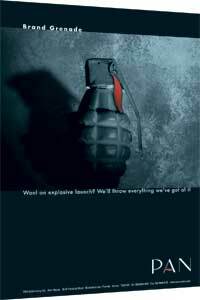 Shame too that someone felt the need to explain the punch line; hand grenade .... brand grenade .... Oh, I get it. I'm afraid the barrage of puns and the lack-lustre shot make it more bland grenade. I actually much prefer their themed "all-staffer" ads. Yes, they're a bit daft but I get the sense of an agency with a strong team ethic that is not shy to have a laugh, even at it's own expense. I think that's really important and highly commendable. And I suspect their clients do to. Verdict: Pretty stable stock. You won't lose, but you won't make a killing either. Buy. Sell. Whatever.